Here are the ten most important things you need to know about Australia's native stingless bees! Q1. What are stingless bees? Q2. In which parts of Australia are stingless bees found? Q3. How do I keep Australian stingless bees? Q4. Where can I buy some Australian stingless bees? Q5. 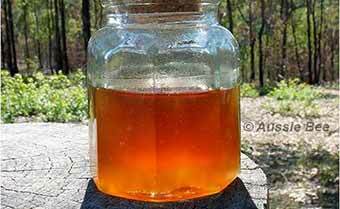 Can I harvest honey from Australian stingless bees? Q6. Can I pollinate crops with Australian stingless bees? Q7. Are there any workshops on stingless beekeeping? Q8. Where can I learn more about Australian stingless bees? Q9. Where can I read free articles about stingless bees? Q10. How can I stay up to date with stingless bee news? Australia has eleven species of small black stingless bees. 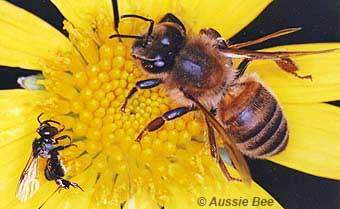 They are about 4 mm long -- see the photo below of a stingless bee compared with a much larger commercial honeybee. Some species are black with white fur on their faces and sides. Other species are black with tiny yellow markings on their backs. They build resinous nests inside hollow trees. Above: One of the spectacular photos of stingless bees in our Photo Galleries. This photo was taken by Peter O.
Stingless bees are tropical. So they only thrive in warm areas of Australia such as Queensland, northern areas of WA and NT, and north-eastern areas of NSW. To find out more, read our article: Which Native Bees are in Your Area? 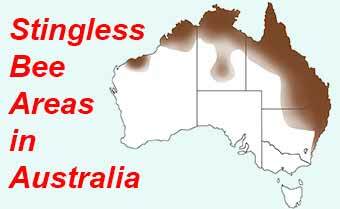 These are the areas where stingless bees occur naturally in Australia. The Tetragonula species are generally more coastal while many inland areas only have the Austroplebeia species. 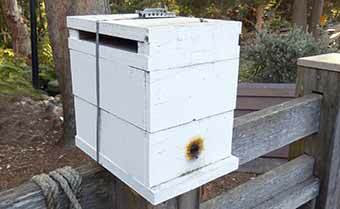 Native stingless bees can be kept in a natural log or in a hive box in suitable parts of Australia. These bees are easy and safe to keep in your backyard but you need to learn about their special requirements. To find out more, read our article: How to Care for Your Nest of Australian Stingless Bees. Aussie Bee provides a list of many breeders who can supply hives of stingless native bees. It is important to buy a bee species and a hive design that suits your area. So have we grouped together the hive sellers whose bees suit various areas of Australia. Visit our hive sellers' page: Where to Buy Stingless Bees in Australia. Stingless bees only produce small amounts of honey - less than one litre per year. However, this honey (known as Sugarbag) is delicious and tangy! It is possible to harvest small amounts of honey from suitable hives in warm parts of Australia. To find out more, read our article: Honey Production With Stingless Native Bees. Delicious Sugarbag honey harvested from a hive of Australian Tetragonula stingless bees. Stingless bees can be excellent pollinators of certain crops in Australia. They are particularly useful for macadamias, mangoes and watermelons, and for crops grown inside greenhouses. Some breeders can supply hives of stingless bees for crop pollination. For more details, read our article: Crop Pollination with Native Bees. Dr Tim Heard runs popular workshops on stingless beekeeping in both Queensland and New South Wales. For details of these workshops and other seminars on native bees visit our page: Native Bee Seminars and Special Events. 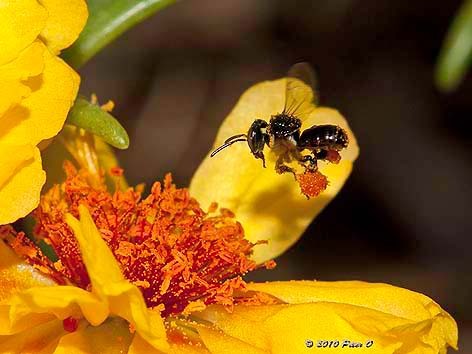 Aussie Bee has written a set of detailed booklets (all recently revised) on native stingless bees - their nests, behaviour, species and a detailed guide to boxing and splitting hives. Tim Heard's 'The Australian Native Bee Book' (published in 2016) presents a complete guide to keeping Australian stingless bees -- with superb colour photos and diagrams. It also takes you on a tour through Australia's solitary and semi-social native bee species. John Klumpp's excellent book, 'Australian Stingless Bees' (published in 2007) is a detailed, easy-to-read guide to keeping our stingless native bees. It's written from the viewpoint of the native bee enthusiast. To find out how to purchase your copies of these publications, visit the Aussie Bee Shop. Aussie Bee also publishes great free articles about native stingless bees in the Aussie Bee Online section of this website. Topics have included fighting swarms, nest structures, stingless bee breeding and protecting hives against small hive beetles. The articles cover the latest research findings from the scientists and great ideas contributed by stingless bee keepers. Look through the index of all our free native bee articles on this page: Aussie Bee Online Articles. To find out all about the latest new articles, publications, photos, videos, workshops, seminars and other news about stingless native bees, subscribe to Aussie Bee Email Updates. These free updates are sent out about three times a year. You can unsubscribe at any time. Aussie Bee Website also has a Facebook page where we announce native bee news and post interesting new stories and photos on our stingless bees. Other Facebook Pages with great information on Australian stingless bees include Sugarbag Bees, Bee Yourself and Wide Bay Stingless Bees. How to buy a nest or box of stingless bees. How to care for a nest or box of stingless bees. Crop pollination with stingless bees. Honey production with stingless bees.